Leave me a caption or two or three. I'll squirrel them away 'till Saturday. The darker side of the "Toy Story" franchise. 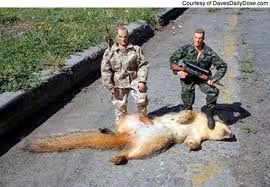 After Sandy Squirrel was caught in a three-some, with Sponge Bob and Patrick. She was banished from Bikini Bottom, but GI Joe didn't like the negative attention it gave cartoons! They finally released photos of the leader of the "tail-i-ban", Usama bin Squirrel'in! "I told you Boris. If dese disguises could fool flying squirrel, da big dumb moose vill be piece of cake." With the menacing peanut bandit out of the way real men in bars everywhere were able to enjoy peanut night without fear. How much do you think Jimmy Carter will pay us for this? The last time I bagged a rodent like this I had to buy it drinks first. The new Cabelas Hunting gear, complete with squirrel scent for attracting the bigest of prey. Don't Ask, Don't Tell -- helping soldiers like Blaine and Chet defend the homeland from oversized rodents since 1993. Whitey and Dufus refute the idea they are city boys by bringing down their first kill. Laughing Mom's caption is killing me! This is enough to feed the whole platoon! Finally... GI Joe picks on somebody his own size.